It’s spring! The weather is warming up and trees and flowers are starting to bloom, so we all know what this means….its time to spring clean! 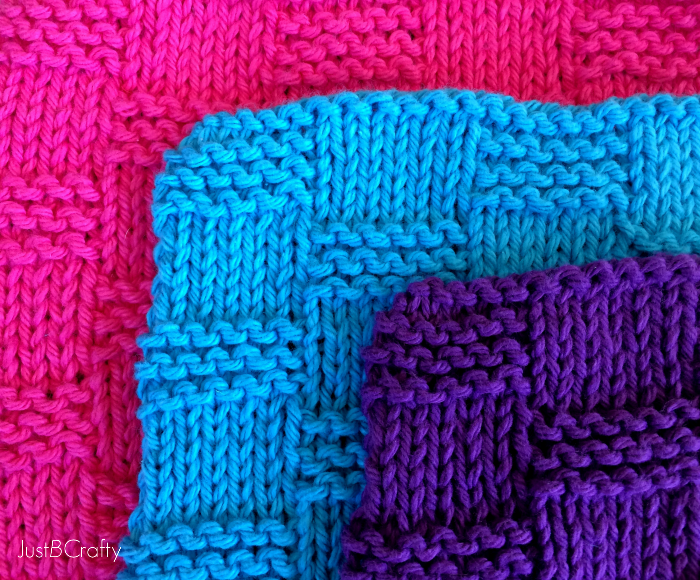 I’m typically not ever excited to clean but I thought making some cute bold colored dishcloths would help motivate me to do the job. Will it work… maybe. Only time will tell. I will say though that I do like how they look resting over the kitchen sink. They brighten up the whole space! Bind off. Cut yarn and weave in ends. « The Just Be Crafty Shop Grand Opening + Giveaway!! I wish I knitted so I could make these — love the design! Hi Sarah, thank you! So glad you stopped by! What wonderful spring colors! And thats such a cool texture! Also I wanted to nominate you for the Liebster Award. If you don't know what that is its an award passed around newbie bloggers to learn more about each other, make friends, and network. If you want to know more just email me! Very very cute and super simple (which I LOVE). Great color choices too! i'm thinking there is going to be some knitting in my mother in laws very near future. These are cute. The colors look great, I don't' think I would want to mess them up by using them as dish towels. Hey Brittany! I noticed staring on row 8 instead of 3 groupings of the stitches there are 4…..This is the only time this happens! Should it be this way? Just checking as I am new to using patterns! Thanks for sharing ! 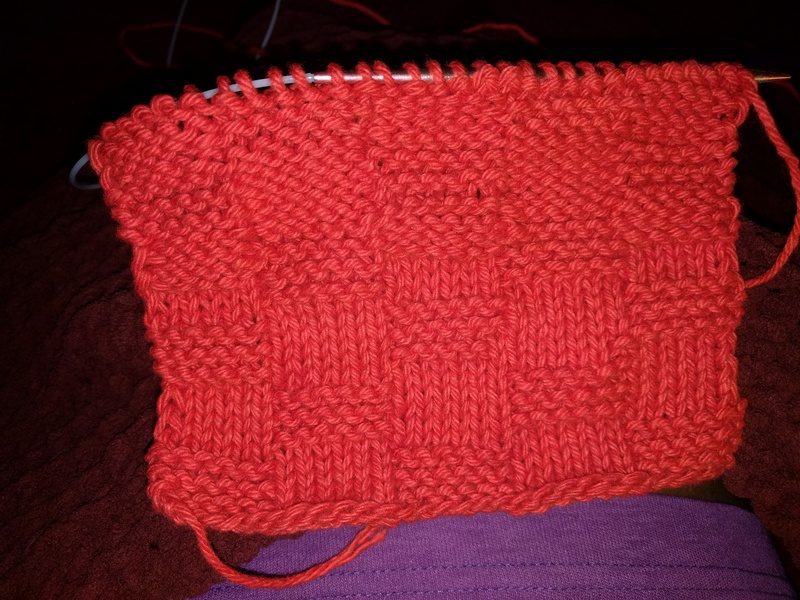 On my second Basket Weave washcloth! I made this and it came out great! Thanks for sharing your pattern. As Annette said I also noticed the 1 grouping of 4 P6, K6 and just did it as 3. Anyway, thanks! I've shared on Ravelry and linked to your pattern. Hi Laura! I'm so glad you tried out the pattern, and I checked out your dishcloth and it looks awesome!!! How do you bind off so that the end looks as good as the beginning. I made your seed stitch pattern and it went really well until I tried to finish it. It looked as if I had crocheted it. I am an inexperienced knitter. I love your patterns and you give great directions. Hi, thank you so much! I'm glad you enjoyed the seed stitch pattern! As for binding off…I know what you mean. 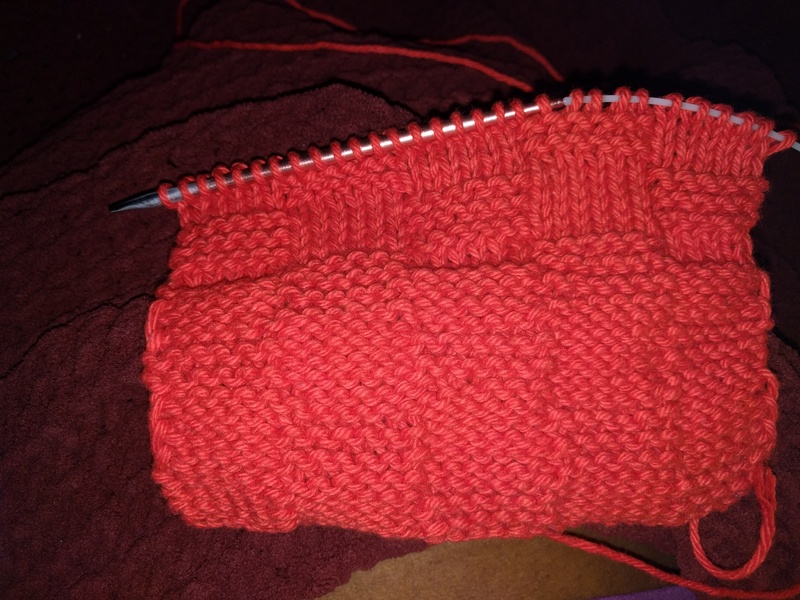 With something like a dishcloth the bind off row won't match exactly to the cast on row, but it shouldn't be too noticeable. 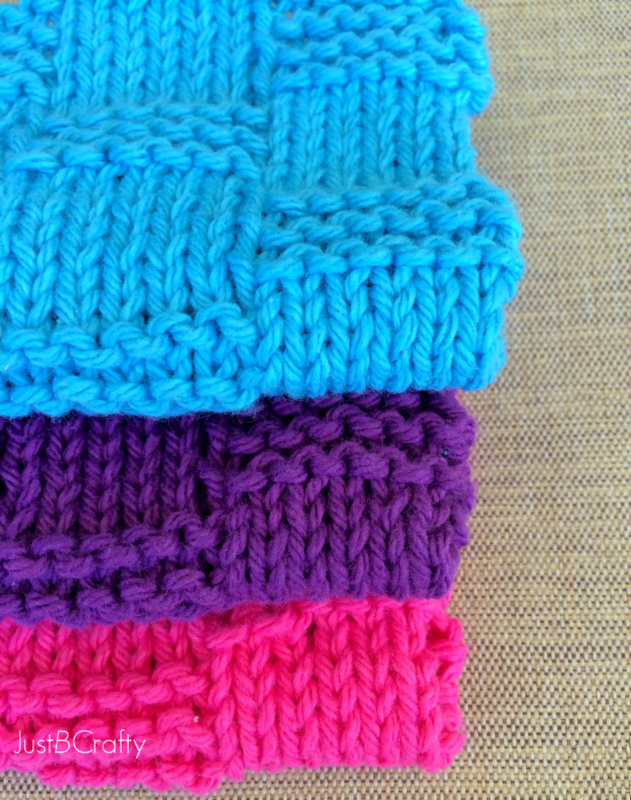 This is the bind off method I use: knit 2, slip first knit stitch over 2nd knit stitch and off the needle. Knit 1, slide prior knit stitch over and off needle. Keep repeating until the end of the row and secure. Thank you so much for sharing this with me. For a novice like me it's very encouraging. Have a great day! I love how simple it is to knit this design! I’m going to be volunteer teaching a knitting class at a summer camp, and this pattern seems like a great one for beginners. Could I share this pattern with my students, if I include credit to you and your blog? 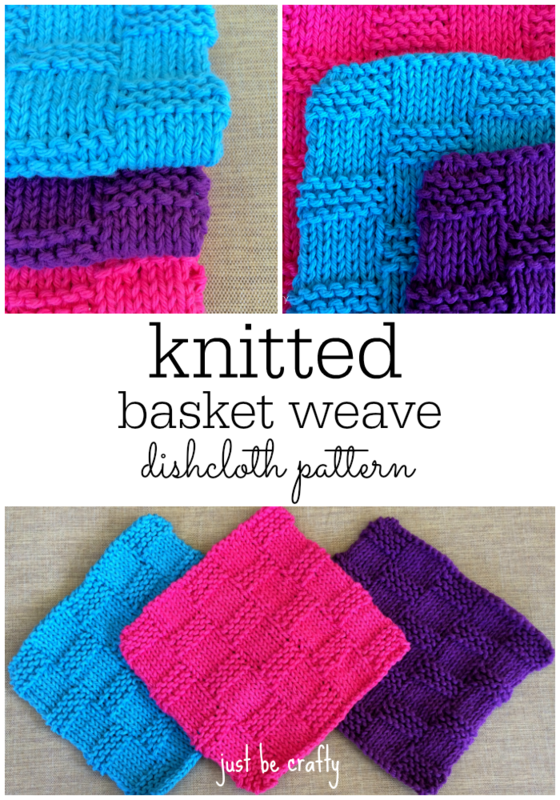 Love these dishcloth ideas. So simple to make. I`m getting ready for a craft show for in November. I`ll definitely make a few of these. The directions do not create a basketweave pattern. Instructions say to knit every other row which appear to be incorrect.. I researched this pattern online and none of them have alternating knit rows. Might be a nice pattern if corrected. As a beginning knitter I wasn’t sophisticated enough to realize the instructions were wrong and wasted a lot of time on this. Hi Loleta! Thank you for leaving your comment. I’m sorry you’re having trouble! Where specifically are you having issues? The basket weave design in this pattern only shows on the front, and is not visible on the back. The pattern is correct as written, and it is my original design so it should not match another pattern’s instructions. Please let me know the row you are specifically having issues on and I will see what I can do to help. Thanks Patricia!! And yes, I have linked to my mini bow pattern below. 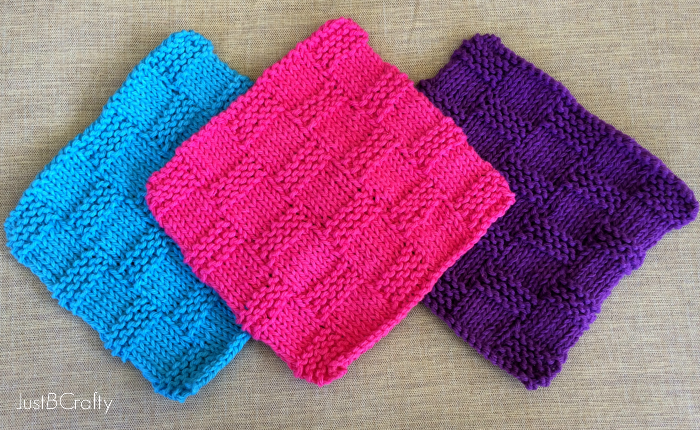 From looking at your dishcloth, it looks like you have gotten switched up on your rows. It is important to note that the odd number rows is the front of the work, and the even numbered rows are the back of the work. On the odd numbered rows (or front), you will only ever knit and the even numbered rows (or back) you will be alternating the groups of knit and purl stitches. Also, this basket weave pattern will only show on the front side, it is not a reversible design. Hope this helps, let me know if you need any more assistance! I love the dish clothes! I am confused though with the pattern. It says to cast on 30 stitches: row 1. Knit across. row 2. K6 P6 repeat to end. That is a total of 12 repeated stitches and it doesn’t divide evenly by 10… Should the cast on be 36 instead? Hi Georgia! When you knit it out, row 2 will end up being: k6, p6, k6, p6, k6, and should technically read *k6, p6; repeat from * 1x, k6. (This will equal 30 stitches) This was one of my early patterns and was not written in the most efficient way :). I love these patterns. I only wish I could finish one without making a stupid mistake! I am making them for my sis in law. I ripped out all of the stitches on this one and started over. I finished it today with no mistakes! I made it in turquoise and it is very pretty. I would like to do one of the textured ones with no mistakes! I would also like to make the seed stitch one but I am just not understanding those instructions. I have several colors of this yarn that I bought a couple of years ago to make Ojo de Dios with. I am so happy that I found your patterns!! The whole knit the purl and purl the knit just throws me. I watched the video and still don’t get it. I guess I just have to have it written out like the other steps. I finished my second textured one today and it has the same mistake as the other one, only in a different place! It looks like I put in an extra row or something. I don’t know how it happens or how to fix it. I’ll try for a third time though and try to get it right! Hi Debbie! You will need to cast on 42 stitches in order for the pattern to work. Let me know if you have any other questions!